Goals from Benjamin Hübner and Lukas Hinterseer earned FC Ingolstadt 04 a 2-0 victory over SV Werder Bremen at the Audi Sportpark. Ingolstadt, looking to bounce back from last weekend’s 2-0 defeat to VfL Wolfsburg, took the lead after just twelve minutes. Bremen keeper Felix Wiedwald managed to keep out Almog Cohen’s initial header but after Dario Lezcano struck the crossbar from the rebound, the ball eventually fell to Benjamin Hübner to lash in the opener from point-blank range. 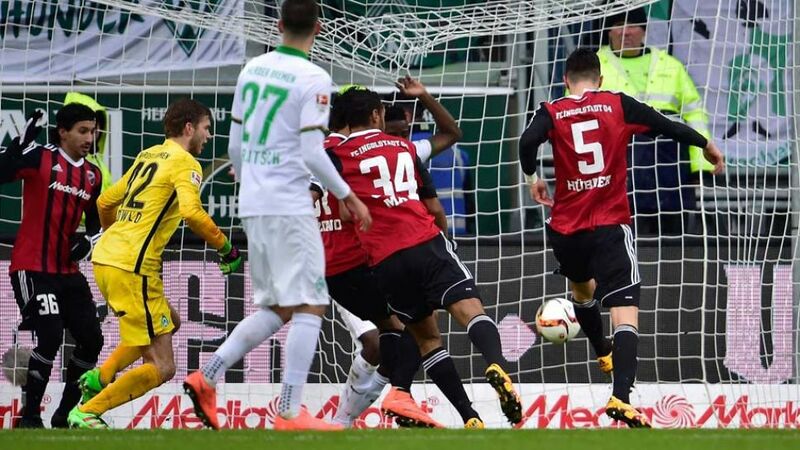 Anthony Ujah could have restored parity just before the half-hour mark, but the Nigerian was thwarted by Schanzer custodian Ramazan Özcan. Die Grün-Weißen upped the ante after half time but apart from a Jannik Vestergaard header that flew just over the crossbar, the visitors struggled to fashion any clear-cut opportunities to level the match. With time ticking away, Ingolstadt broke forward and won a penalty when Robert Bauer was brought down in the area by Sambou Yatabare. Lukas Hinterseer’s first effort had to be retaken, but the 24-year-old made no mistake from the second attempt to seal the points for Ralph Hasenhüttl’s side. As well as scoring the opening goal of the game, centre-back Hübner helped his side secure an eighth clean sheet of the season with a rock-solid defensive display at the Audi Sportpark. Viktor Skripnik’s Werder have failed to kick on since their impressive 3-1 win at FC Schalke 04 on Matchday 18 and remain in a perilous position near the foot of the standings. With trips to FC Bayern München and Bayer 04 Leverkusen to come, Bremen’s upcoming home games against SV Darmstadt 98 and rock-bottom Hannover 96 have taken on an added importance. Hübner’s 12th-minute strike was Ingolstadt’s fastest ever Bundesliga goal.Ten of Die Schanzer’s 16 league goals this season have come from set-pieces.Hübner won all five of his duels with Bremen striker Claudio Pizarro.